The tragedy of the last episode’s attack continues as the Titans lay siege to the city. Picking up right after the end of last week’s gruesome events, we see the Titans advancing through the city. It turns into a bloodbath as townsfolk scramble to get away, with many meeting an unfortunate end between the chompers of a Titan. I could never get used to hearing the sound of flesh being ripped apart, and imagining these poor people being eaten alive gives me the shivers as I write this. The visual imagery is haunting and tragic and horrifying on so many levels, and it doesn’t help that the Titans are creepy. Their constant smiles are eerie and unsettling, making it that much more horrifying. The attack culminates in another new Titan entering the fray. This big hulking beast rams the front gate with tremendous speed and power that it shocks everyone that witnesses it. For comparison: think Berserker from the Gears of War games. With the humans fleeing on the boats, they are forced to accept defeat as Wall Maria falls to the Titans. Young Eren, eyes full of tears and anger, vows to become stronger and kill every single Titan. It’s a bold declaration from a young child, and after all that he’s experienced in the span of like 30 minutes, you can’t blame him. Watching the Titans invade was truly terrifying. You could see the hopelessness of the situation as the humans, woefully unprepared for an attack on this scale, push and shove each other to safety. 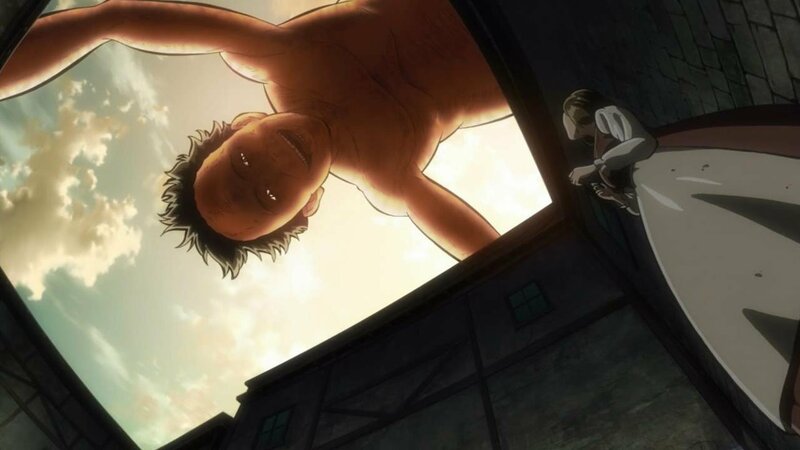 In addition to the colossal Titan looming over the wall, the humans now have the big rampaging Titan to worry about as well. And the smile that all the Titans seem to have? It gives me nightmares. 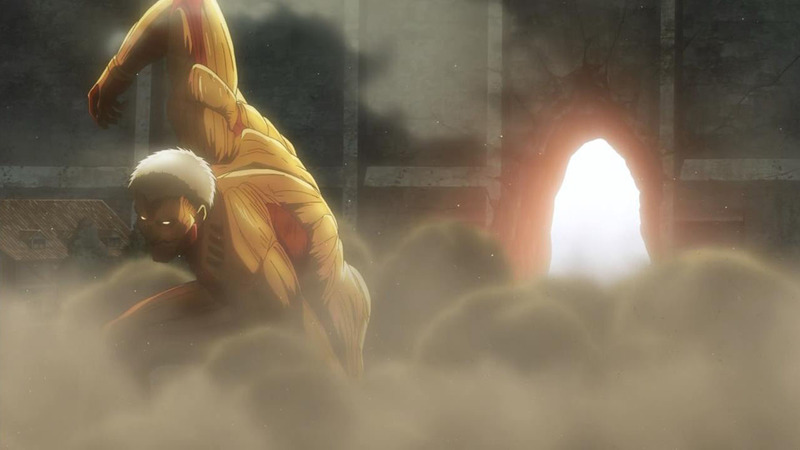 I don’t think I can forget the smile on the Titan’s face as he ate Eren’s mother. Truly terrifying stuff. One thing the show does really well is show the helplessness of the humans in the face of extinction by Titan. Eren, Armin, and Mikasa can only look on as they watch the city fall to the Titans. The defenses are practically useless and do nothing to stop the onslaught. Food shortages and overpopulation from refuges make living conditions tough on everyone. And with an unprepared army, many are forced into the army, with unsurprising results. After 100 years of no conflict, humanity has its back against the wall (literally) and things do not look too good for our heroes. Things are certainly getting crazy and it’s only the second episode. As the episode ends, we see our three protagonists join the army corps and begin boot camp. We get a glimpse of some of the other characters that we see in the opening, and we see Eren put on his determination face once again. At this point, Dung was excited to see some action, and the upcoming episode seems to follow our young recruits training to become Titan killers. With great pacing so far, I’m excited to see what happens next. I still can’t stand seeing people getting eaten. It gives me the jeebers.